Emotes /rude when summoned outside of the Winter Veil holiday. 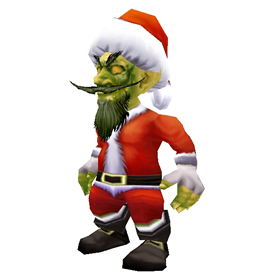 The quest, You're a Mean One..., is a daily quest that can be completed once per day during the Feast of Winter Veil. Upon completion, players are awarded with a Stolen Present which has a chance of dropping this companion pet. This companion is very vocal about being summoned outside of the Winter Veil holiday, and will not remain by the player's side during the off season. During the Feast of Winter Veil, this companion will summon and ride their very own miniature reindeer when players mount up on a ground mount. Splashes the enemy with freezing damage, dealing 295 Elemental damage. Deals 197 additional damage if the target is Chilled . Launches an orb of freezing energy at the target. After 3 rounds, the ice hits, causing the current enemy pet to take 591 Elemental damage and be stunned for 1 round. Deals 492 Elemental damage and causes a Blizzard for 9 rounds. During a Blizzard, all pets are considered Chilled . I can confirm it drops from the Stolen Present rewarded by the "You're a Mean One ..." daily quest. Level 80-90 characters can complete that quest. It took me fourteen tries before I got the pet (different characters). New Christmas gift package drop added for the 2013 Winter Veil. BEWARE what you buy on the AH. Don't pay extra for a P/P breed or buy two thinking you'll have one of each breed. All the pets start out as a B/B breed according to the add-ons, but when you use a stone to make it rare, or when you level the pet to 10, it turns to P/P breed. According to a post by Synapto, "the reason for this is stated by the library author: at low levels (especially Level 1), it is harder to tell some breeds' stat weighting apart from each other." You can still battle stone them Ranok... I just did it. You have to summon it and use the battle stone on it before it runs off is all. Just gotta be quick. This creature apparently drops from the 'Stolen Present' gained from the Christmas daily: 'You're A Mean One'. P/P Breed with 333 power makes this a very strong hitter. Strongest Minefield ability(booby trapped presents). Greench's Gift is a game changer, hits very hard. Call Blizzard is available to make best use of Ice Lance, but with 333 power the Club will hit quite hard for a 100% hit ability. Ice Tomb can also be truly powerful. With the 333 power this little guy can really bring the hurt, but it might be slightly delicate with just below 1400 health and no defenseive moves. Still solid pet. Got one really early, and sold off my second thinking they'd drop better, now wish I had kept it. Love getting the hang of swapping him in an out of a battle to get the most out of his beast slaughtering. His damage reduction against critter attacks should make him very useful in wild pet battles, it's a shame his most frequent attacks (slot 1) will have to take a hit against critters or beasts, but those presents pack a punch; swap him into Corageous Yon daily to carry a lowbie. Reminder: Mages can help folks via Portal: Ancient Dalaran to quickly get to the target area of the Greench Daily. Just make sure you are mounted on a flying mount before going through the portal. My pet journal and/or addons seem to be confused when it comes to this pet. It says the only breed available is B/B. But then it claims I have a P/P in one spot and says in another that I have a B/B. The stats match those listed on this site. With 12 power and 10 speed while uncommon and level 1, it makes much more sense that this is P/P. Things could change, but I thought I'd mention this for people like me who come here wondering. I don't think he's supposed to be a goblin. I think he's supposed to be a leper gnome. So I just got one. Get on a ground mount and he gets on a reindeer mount! A miraculous pet for Wailing Caverns. Booby-Trapped Presents and Greench's Gift deal 1059 damage *each* when used against Deviate Smallclaws, what means he can dispatch a couple of them before they can even think about their dirty Primal Cry! Against other trash pets, a combination of both is such effective aswell – even the flappers can't act first as the BTP take their racial bonus away. After all, 1412+ damage can be very handy for any non-elemental occasion. I love this little guy! I have 3 rare 25s and use them as my go-to leveller regardless of what I am fighting. He can decimate beasts in a heartbeat! Got him this morning. Man, the naughty things this little guy says. Named him "Barry Naughty". update - leveled him up to 25 after stoning him. At 23 he was taking out full teams of level 25 wild pets, mostly fighting aquatics and flyers. Bought one off the AH today and my BreedID addon was saying he was only available in B/B. As soon as I leveled him he was showing up as P/P, so it may be a bug with BreedID... With 333 power at level 25 he's the most powerful of the Winter Veil pets by far! I got the Rotten Little Helper yesterday from the daily quest, so it does drop. Broke down and just bought one off the AH. Interesting pet and hits like a hammer. Battle Info tab lists Breed as P/P. I own 2 and one is a P/P and one is a B/B. Is my addon being wonky or are there more breeds possible for this pet?